Multicolored Asian lady beetles can find shelter in bark and leaf litter during winter. With daylight saving time back in place and warmer temperatures knocking at our door, spring is finally crawling toward Wisconsin. The winter of 2018-2019 is one we won't soon forget — the season started out mild before temperatures plummeted with January's polar vortex. During the coldest stretch, our coping strategy might have involved layers of blankets and binge-watching Netflix, but what about the bugs? Questions regarding the cold-weather impacts on insects have been some of the most common at the University of Wisconsin Insect Diagnostic Lab over the winter. There will undoubtedly be some effects from the polar vortex, although many insect species are well-equipped to deal with the cold. Before we know it, overwintering insects will become active again in the Midwest and many species will simply shrug off the polar vortex as if it hadn't happened. As for insects that didn’t fare as well in the cold, high reproductive capacities will likely allow their numbers to bounce back relatively quickly. That means 2019 isn't going to be insect-free by any means — and intuitively this makes sense. It’s understood that every year, insects make it through the winter months and become active as temperatures creep up in spring. Looking at an evolutionary time scale, the January 2019 cold snap wasn't the first time insect species in Wisconsin have encountered frigid temperatures before, and many creatures are adapted to survive surprisingly cold conditions. Wisconsinites might have chosen to block it from memory, but the state experienced a very similar situation a mere five years ago. Weather patterns in January 2014 saw temperatures dip to -20 ˚F and colder in some spots around the Midwest. The following summer, there was still plenty of insect activity in the region. During a polar vortex in January 2019, temperatures across Wisconsin dipped well below zero. Since insects don't bundle up with six tiny mittens, how do they make it through the winter? Well, it turns out that insects and other arthropods like ticks and centipedes have a number of strategies to help them survive. For starters, insects typically have a particular life stage (e.g., egg or pupa) that is more tolerant of adverse environmental conditions, such as freezing or desiccation. Passing through the winter as a more resilient life stage is a good starting point. Some of their other strategies are surprisingly similar to humans. Just like snowbirds heading to Arizona or Florida for the winter, certain insects like monarch butterflies and green darner dragonflies migrate southward to avoid the coldest temperatures. Wisconsin's official state insect (the honey bee) doesn't migrate, and instead chooses to remain active. Honey bee colonies shiver together as an insect version of central heating to keep the inside of their hive a constant temperature. Other insects simply seek shelter and overwinter in protected locations to avoid the worst of the cold. Insects like multicolored Asian lady beetles, boxelder bugs, and invasive brown marmorated stink bugs are fond of sneaking into man-made structures to spend the winter. If insulation and heating make homes warm enough for people, it’s plenty warm to prevent insects from freezing. In more natural settings, such insects might end up sheltering in rock piles or beneath the loose bark of a dead tree. Those locations might not be as toasty as a house, but they can still provide adequate respite from the cold — that means insects using this strategy should have been well protected from January's cold spell. Similarly, many insects and other arthropods spend the winter below ground or on the surface amongst a layer of insulating leaf litter. In addition, many parts of Wisconsin had a solid covering of snow by the time the polar vortex arrived, so creatures such as ticks had a thick layer of insulation from the coldest of the cold. Another strategy insects utilize is the production of natural antifreeze compounds (specific alcohols or proteins), which serve as cryoprotectants to help prevent freezing within their bodies. A cup of water will turn to ice at 32 ˚F, but dissolve salts or other substances in that same water and it will require colder temperatures to freeze it. Insects producing high concentrations of these cryoprotectants can remains unfrozen at surprisingly low temperatures, similar to a bottle of high-proof spirits kept in a freezer. 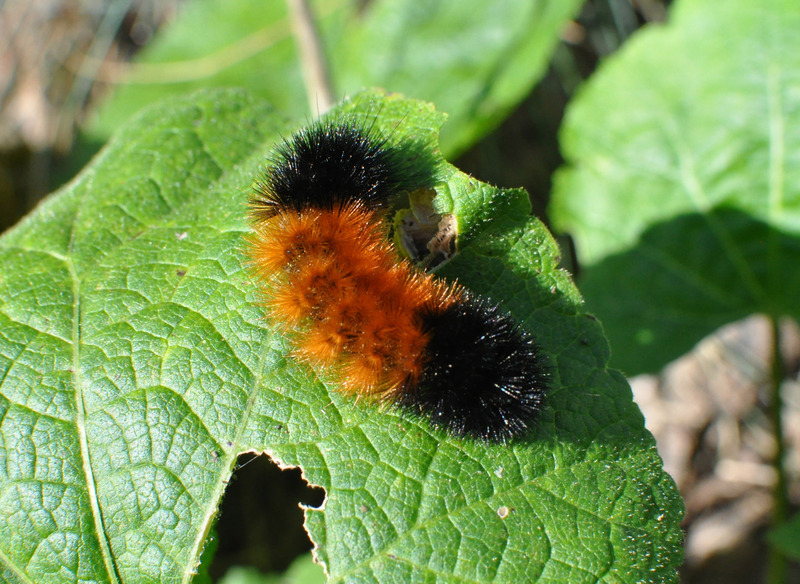 The ubiquitous woolly bear caterpillar (Pyrrharctia isabella) is well adapted to winter conditions. Taking it even further, the common black and brown woolly bear caterpillars seem to embrace the cold and actually allow ice to gradually form within their bodies. This strategy may sound like a fatal mistake, but by regulating the formation of ice crystals on their own terms, woolly bear caterpillars are able to control where ice formation occurs and limit it to specific areas of their bodies to prevent damage. If the same caterpillars were unprepared and froze rapidly, their cells might burst like a can of soda put into a freezer. What about the emerald ash borer? The species the UW Insect Diagnostic Lab has gotten the most questions about since the polar vortex has been the emerald ash borer. While not native to Wisconsin, this invasive pest comes from similar latitudes of eastern Asia and the cold-hardy larvae are fortified with cryoprotectants as they spend the winter beneath the bark of ash trees. These natural antifreeze compounds have their limitations though, and just like sidewalk salt failing to melt ice on a really cold day, the cryoprotectants only work down to certain temperatures before freezing (and death) occurs. For the emerald ash borer, the point at which freezing spontaneously begins to occur — known as the supercooling point — is when temperatures dip into the range of -13 ˚F to -23 ˚F. 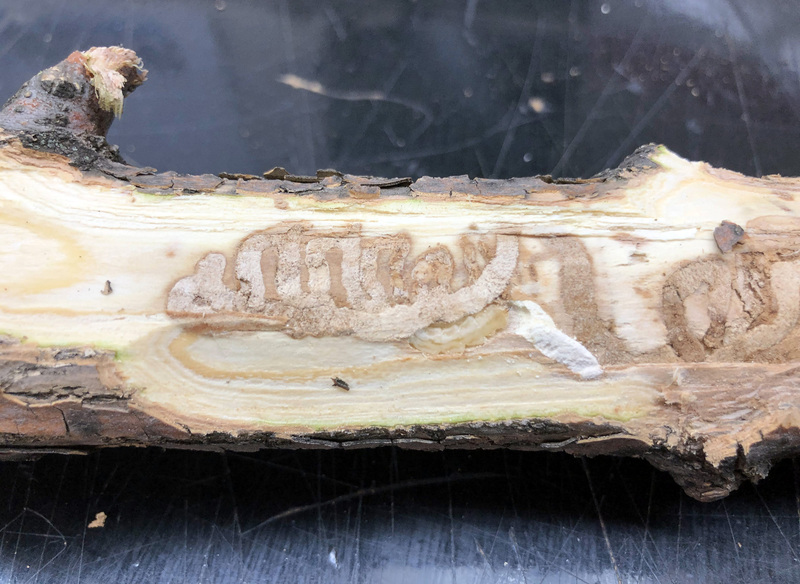 The 2019 polar vortex did see temperatures fall into and below that range in Wisconsin, which would have killed plenty of emerald ash borer larvae, although the insulating effects of the tree bark likely provided some buffering. The pale end of a surviving emerald ash borer larva sticks out from its tunnel in wood collected in the Milwaukee area in March 2019. When larvae are killed by freezing, they typically become discolored. Emerald ash borer populations will almost certainly take a hit from the polar vortex, but it's not going to be a knockout blow. Give it some time, and the reproductive capacity of this invasive species will allow populations to rebound. The news reports of cold-induced emerald ash borer mortality in early February might have been encouraging, but scientific models from the U.S. Forest Service suggest that to really knock them down in the long run, Wisconsin would have to experience Arctic blasts on a regular basis — something that many Midwesterners aren't likely to receive warmly. 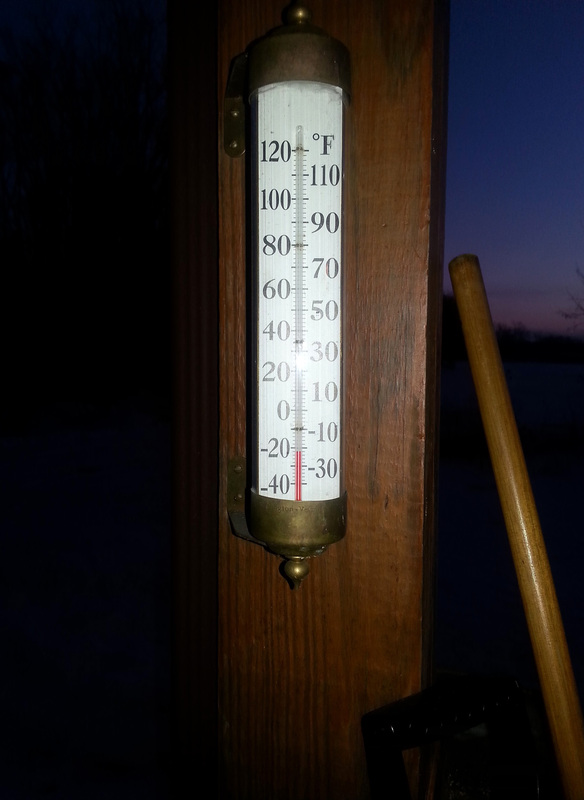 Editor's note: A Feb. 6, 2019 interview on Wisconsin Public Radio’s Central Time with University of Wisconsin-Stevens Point entomologist Jamee Hubbard also explores how insects and other arthropods cope with cold temperatures.